Welcome to Seedly’s inaugural Personal Finance Festival 2019! Want to invest but not sure how to? Join our panel speakers as they share the various methods you can choose to invest with your salary! 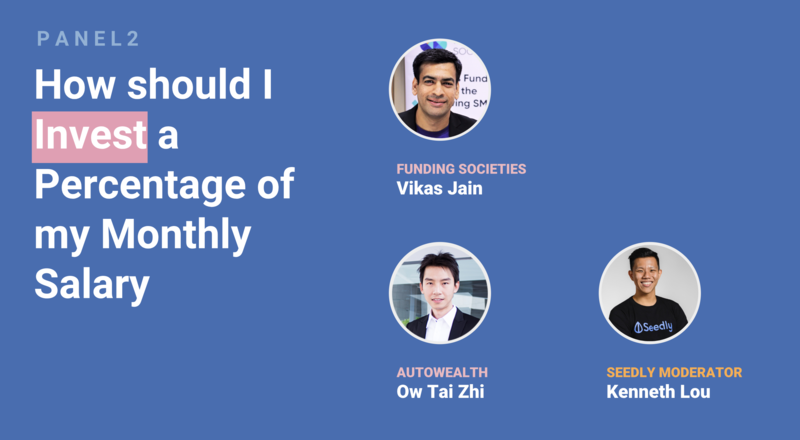 This panel will be moderated by Kenneth Lou from Seedly. Hey! Whether a HDB is a good first choice for a new buyer is a question of affordability. You are right that at the end of the day you return it to the govt. However, because of the generally lower quantum compared to private properties, it is usually where first time buyers start their real estate asset journey. If you can afford a private property right away as a new buyer, why not? Less restrictions and greater investment potential. Cheers. What stocks outperform during interest rate hikes? Hi there! Some sectors that benefit from interest rate hikes are consumer discretionary stocks, in other words manufacturers and sellers of consumer staples (food, beverages & hygiene goods) and healthcare stocks . Healthcare stocks will continue to perform as consumers still need to go to the doctor and buy medicine in spite of the market doing well or bad. If BTO is not an option, and SBF/ROF is out of reach (failed multiple times), the only option left is resale flat. Is buying an old flat (above 40y) more viable or a relative new flat (Less than 10y)? Hey! When buying an older flat, I second Zuhdy that you have to be sure that you won't need to sell either to cash out for retirement, or to upgrade to a new one. Make sure that you don't outlive the remaining lease of your flat too! Reason is because a HDB flat with a short lease depreciates very fast and is going to be very difficult to resell again. A newer flat however, can still retain it's value well. I would recommend not overstretching yourself though, if it's your first property. Go smaller, and upgrade later when the need comes. Putting it in the simplest terms, the cost of using your CPF funds is 2.5% per annum. (compounded, and ignoring the additional 1% on the first $20k) So, if you can make more than 2.5% compounded returns on your cash, then use your CPF for mortgage. Otherwise, use your cash.